"Access and deactivate suspected hazardous devices"
The JTK-73LR is a full capability backup response tool kit for professional bomb squad technicians. Designed for use in render safe or post deactivation environments. This kit was developed in cooperation with experienced professional bomb technicians from P.D. 's and I.A.B.T.I members. Used by a variety of organizations including city, state and federal law enforcement agencies, as well as the military E.O.D. community. 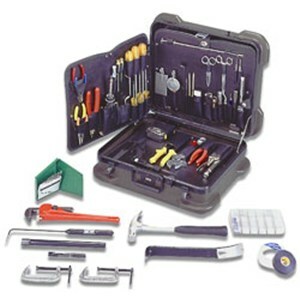 Tools are contained in a two-pallet configuration that is housed in a high density Rugged-Duty case. Rugged-Duty case features military style twist latches, spring-loaded handle, tongue and groove valance, combination lock and padlock loops. This field proven case provides increased longevity in harsh field conditions. Inside dimensions are 17.75 x 14.5 x 9” deep. 1 of Jonard DIAGD6 D6 Bell, Diagonal Cutter, 6"
1 of Jensen Tools 07-00-006382 Pallet Set, Side Hinge and Bottom F/ JTK-73LR 17.75 x 14.5"
1 of Ullman C-2 Mirror, 2-1/4, 10-14"
1 of Flambeau 5128CL 7 x 4 x 1-1/16"
1 of Wiss M3R (C004091) Straight Cut Tin Snips, 9-3/4"
Click the button below to add the Jensen Tools JTK-73LR Bomb Squad Kit to your wish list.